(…continued) There is still another factor to add, and that is the influence of God and the devil. “I can’t help it,” said a popular comedian many years ago, “the devil made me do it.” The Bible does indeed talk about how the devil tempts us, while at the same time, the Bible does not let us off the hook for failing to resist the temptations of the devil. Christians do believe that it is indeed God who has a lot to do with the hand we have been dealt. It is, after all, God who has given us life, and the gifts and abilities we were born with. Here too, what we do with those gifts and abilities is up to us, but any credit we take for our accomplishments must certainly be shared with our Creator. What I like about how David Horowitz tells his story is his openness and honesty about his own “most grievous sins,” as in the words of an old prayer of confession. He could have easily spent the whole book blaming his parents, or the times ‘that were a-changing,’ or the Vietnam war, or a whole host of other influences. He does talk in a matter-of-fact way about these forces outside of himself, but never does he seek to excuse his own willful wickedness and deceit and guilt. In Luke 18:9-14 Jesus tells a brief parable that touches on this very issue. 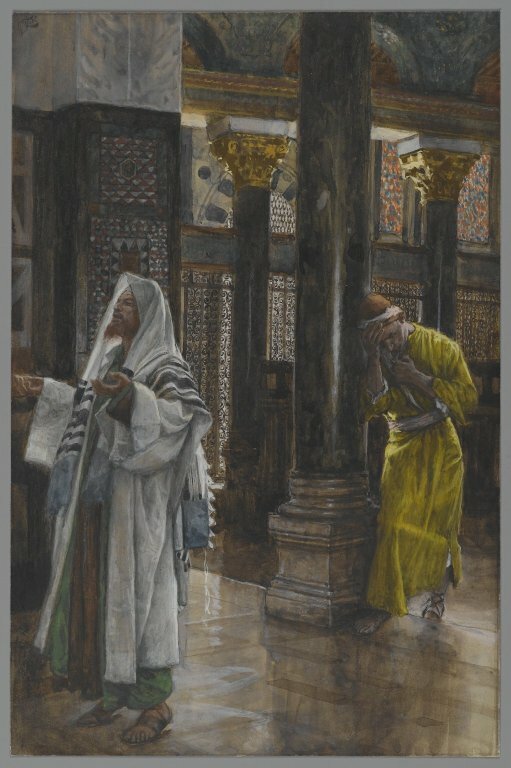 Jesus told the parable to some folks who “were confident of their own righteousness and looked down on everyone else.” The parable was about two men who went to the temple to pray. One was a Pharisee, who everyone knew was a good man. The Pharisees were a snobby bunch, but were good people. They were honest and you would not have to worry about a Pharisee not paying his bills. They would make good neighbors and you would see them in the temple or synagogue on every Sabbath Day. The other man was a lying, cheating, traitor to his own people, who sold-out to the Romans so he could collect their taxes and become rich by doing so. Everyone knew he was not a good man. Most of Jesus listeners had probably been swindled by a tax-collector somewhere along the line. That is what all tax collectors did. Each says a brief prayer. The Pharisee thanks God that he is not like other men, and then reminds God of a few of the qualities that make him the wonderful man that he is. The tax collector says just seven words, “God, have mercy on me, a sinner.” But it was the second man, says Jesus, who went home justified before God. Three things about the parable. First, did you notice both men got what they asked for? The Pharisee asked for nothing, and that is just what he received– nothing. He just told God what a fine fellow he was, and that was it. He asked for nothing and got nothing. But the second man, in a sincere prayer of confession, prayed for God to have mercy on him, poor sinner that he was, and his prayer for forgiveness was answered. Second, this is not a parable about how to live. Rather, it is a parable about how to confess our sins. The Pharisee did indeed do a better job of obeying God’s Law. But even he was not perfect, and in coming before God in prayer, there should have been more on his mind than what a good guy he was. And the publican certainly did need to make some changes in his way of life, but the first step in making such changes is to admit that you are in the wrong; which is what he was willing to do, coming to God with a true heart in an honest and humble spirit of confession. Third, there is the matter of who should take the credit and where one should place the blame. The proud Pharisee takes too much credit for his goodness, and does not even look at his failures. The publican takes full responsibility for his failures, but does not leave it there. He lays those failures before God, and prays for his mercy. Jesus, as always, is more than willing to extend that mercy to one who is repentant. In the end, Jesus would die on the cross in order to extend the offer of that mercy and grace and forgiveness to all who would believe it and receive it. I began with a brief summary of one man’s moral self-examination of the decisions and actions of a lifetime. The Bible speaks a great deal about confession and forgiveness, and the first step toward confession is such an examination of one’s self. It is important that we do that.